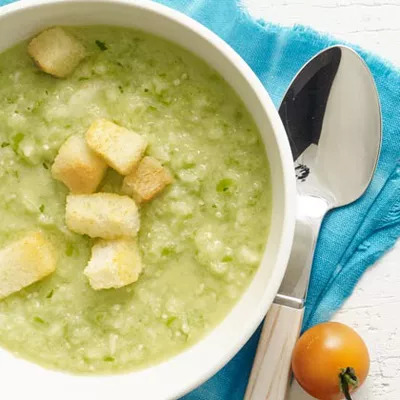 We love chilled soup during the summer. Our green tomato gazpacho has just 228 calories per serving and supplies protein, fiber, and some iron. Plus, it's so easy to make. Combine the tomatoes, cucumbers, thyme, parsley, and other ingredients in a blender, and pulse or blend until you have a chunky soup. Stir in 2 cups of ice-cold water, add a splash of Tabasco, and chill for at least 2 hours. No hot stove necessary! Try this nutrient-rich soup tonight. Ingredients: garlic, bread crumbs, red wine vinegar, olive oil, green tomatoes, cucumbers, fresh thyme, fresh parsley or cilantro, Tabasco, black pepper, croutons (optional).